In an earlier post and on the general topic of quick Asian dishes, I alluded to how much I rely on oyster sauce for everyday stir-fries. I would be a little lost without it because I use it for flavoring and as a base for mixing up a quick sauce for a variety of dishes. If you're into Chinese cooking, oyster sauce is definitely something to keep on hand. It's a thick, dark-colored sauce with deep, savory flavor (it reminds me of Japanese miso in some ways) that's more complex than soy sauce since it's made with oyster extractives (oyster, water, and salt). Generally, a little goes a long way. "Authentic" Chinese cuisine leans on the savory side so oyster sauce is far more common and likely to be tossed into the frying pan than hoisin sauce, which is sweet and tends to be used more as a dipping sauce (though there's a time and place for everything). I grew up eating oyster sauce drizzled over sautéed greens and tossed in a wok with meat and whatever else is cooking to add an instant concentrated savoriness to the food. Given all the talk I've been doing about stir-fries, Asian pantry ingredients, and simple cooking, I wanted to post this easy beef lo mein recipe that I often make at home. It's special to me because it's one of my son's favorite dishes that I make. He's actually pretty selective when it comes to pasta/noodles but this is one he slurps right up. To make this, I buy noodles in the refrigerated aisle at the Asian market, which makes it even easier to get the dish on the dining room table since you don't need to boil water and cook the noodles first. If I haven't planned ahead, I substitute the noodles with regular spaghetti and it works quite well. You can obviously make lo mein with all kinds of add-ins but my family prefers beef. I marinate thinly sliced flank steak and like to incorporate some scallions and onions but you could obviously load it up with all kinds of vegetables (I like to use Chinese chives sometimes) and meat. To flavor and add a quick "sauce" to heat up the noodles and give the dish some moisture, all I do is stir about a tablespoon of oyster sauce into some beef broth. If you're not making lo mein with beef or don't have broth, you could just use water (I used to all the time), in which case up the amount of oyster sauce a bit. It's really easy and, for me, it a surefire hit for dinner with minimal effort. 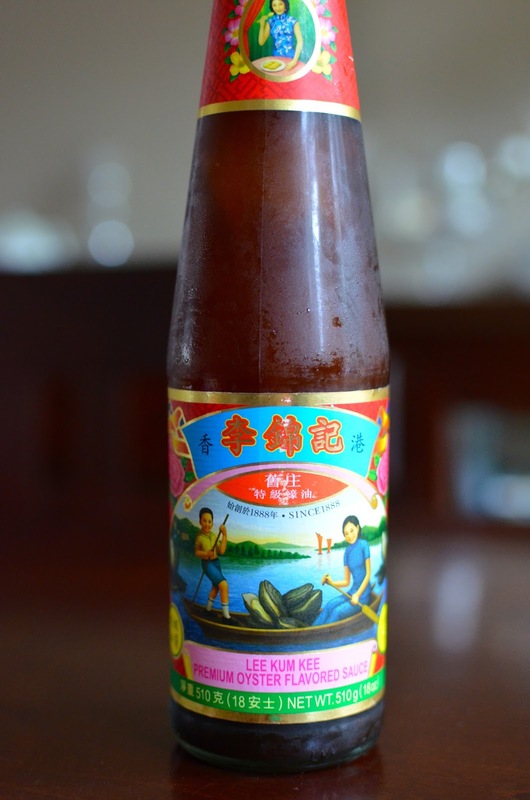 I've been told by my elders to look for this one, the bottle with wording in Chinese and the figures in the boat, and I don't question what I'm told by those who know far better than me. To be honest, I realize that when it comes to most bottled sauces of any kind, there are inevitably additives and other ingredients we'd rather do without. Luckily, we don't generally need to use a whole lot for the right amount of impact. I mentioned that I buy cooked noodles in the refrigerated case at the Asian grocery store and I've shown the one I like to buy above. You really don't need to boil it so it's ready to go right into the hot pan. I let it sit out at room temperature for a bit before cooking and then set it into my broth (or water) mixture to loosen it up and toss all together with the meat and vegetables to heat it through. If you can't get your hands on this, spaghetti is a very good substitute. When I do stir-fry, I often finish the dish with a simple slurry (cornstarch and water) mixed in with a bit of oyster sauce. In this case, there's no need for extra cornstarch because I marinade the beef with some (something my mother taught me to do when I was a kid; she also instructed me to add a pinch of sugar) and with a bit of starch from the noodles, the liquid thickens a bit on its own. There shouldn't be a lot of sauce at all, just enough to coat and moisten the strains. I've tried using a slurry to finish this dish and it's a goopy mess so don't bother. When I'm cooking something I this, I don't really measure so feel free to use more or less meat and vegetables and be sure to taste and season as you like. Add a touch more soy sauce, throw in a few dashes of Maggi, or add a little more (or use a little less) garlic. It's all about what you and your family enjoy. I told my nine year old I'm posting this one for him and I fully expect him to look this recipe up and cook it for himself (and hopefully for me and his dad, too!) one day. Toss beef with soy sauce, sesame oil, sugar, and cornstarch. Let meat marinade for half an hour or up to overnight in the refrigerator. Heat a dutch oven or deep skillet over medium-high heat with 1 tablespoon of oil, the garlic cloves, and red pepper flakes (if using). Add onions, a pinch of salt and pepper, and cook until softened, about 3-4 minutes. Add scallions and toss for about a minute. Remove onions and scallions to a plate. Add remaining 1/2 tablespoon oil to pan, then add the beef and cook for 2-3 minutes, until meat is almost cooked through (it should still have some pink to it and there will likely be moisture at the bottom of the pan, which helps flavor the noodles). Remove beef from the pan onto the plate with the onions and scallions. In a measuring cup or bowl, stir beef broth and oyster sauce together. Add to the hot pan. Add cooked noodles and use a wooden spoon to loosen the noodles (a pair of chopsticks works well too). Cook, stirring often, for a few minutes until noodles are warmed through. Add beef, onions, and scallions back into the pan. Toss to combine and finish cooking the beef. If mixture looks too dry, you can add a splash of broth (or water). Season with a few dashes of Maggi seasoning or soy sauce. Taste, and further adjust seasoning according to your preference. Oooh I know I'd love the flavors in this one!! I love to do stir frys, and all kinds of Asian take out dishes at home, but I have to confess I never buy oyster sauce. It's now top of my grocery list! Definitely worth buying. When in doubt, you can usually add a dash to amp any savory flavor. I wish I knew how to cook more Thai and Vietnamese dishes since we are huge fans. Your homemade pho is on my list of to-do's! : ) And I, too, have fish sauce in my pantry. I couldn't take much spice when I was younger but now I love it and I'm thinking bird chilis need to be looked into. Thanks for the tip! I see the new design / header image on your site! SO cute!!! I definitely going to make this probably this week, maybe tomorrow!! So easy to make and I love oyster + soy sauce combo! Thank you, Nami. Glad you like the mini makeover. : ) This is definitely easy and the oyster sauce and soy sauce brings on so much flavor so fast. To be honest, I haven't experimented much with oyster sauce, but I do think I have a bottle somewhere! Time to lo mein it up. Also, I forgot to mention yesterday that I LOVE the new look! Lovely Monica! Thank you for some more great supper recipe inspiration which I am always on the look out for. I know my kids would eat this without hesitation. Just need to add oyster sauce to the shopping list! I think we all, in the blogosphere here, put so many ideas and inspirations into each other's heads! Even if we don't follow a specific recipe, we share so many ideas and tidbits...I know I learn so much and get such great ideas from people like you! I love oyster sauce as much as teriyaki sauce...need to stock up a couple of bottles too. Your stirfried noodles with beef looks homey and delicious. Love the new blog design, Monica! It is super cute and warm! Very well done! A easy noodle dish is something I always look for. This lo mein totally makes me hungry! I am looking forwards to trying it. Awww...thank you for reading my gibberish, Kelly! It's questionable as to whether my son will ever cook this himself but never know... : ) I'm cautiously optimistic. Looks good! Unfortunately, my husband has a shellfish allergy, so oysters have to stay out of my kitchen. And I hope your 9-year-old makes it for you someday! Yummy dish Monica! I could enjoy this meal any night. I will have to look into those noodles! Thanks, Tricia. Spaghetti is just fine, or any noodle, but these cooked ones make life easy and who doesn't want that! Wonderful dish Monica! I love oyster sauce and keep handy in my kitchen for all stir fry and Asian noodle dishes but the problem is I can not eat it. It I haven't yet found gluten free oyster sauce. So I am going to make this lo mein dish without it for myself. Oh man, I hope they come up with a gluten-free oyster sauce one day! Thanks for checking in! Time for some lo mein soon then, Juliana! : ) You enjoy the rest of your week, too. This looks delish -I like the idea of buying the refrigerated noodles to make this even faster to make! Love this dish and beautiful pictures! I share the same feeling, that oyster sauce is so useful in cooking Chinese dishes! Thanks so much, Maggie. Gotta have our oyster sauce! Asian dishes, with all the quick stir-fry, is such a great thing to whip up for weeknight dinners, Julia! I bet you're fabulous with your Asian stir-fries! This recipe reminded me of the my long-forgotten Oyster Sauce. I love the stuff for Chinese cooking. This sounds delicious! Thank you! It helps make a quick meal, that's for sure. Thank you, Cindy! Noodles are like dumplings - good hearty comfort food! It is likewise wet and chilly here too. I am so glad those pics are helpful to you. I know you are the adventurous one and I can picture you walking those aisles in search of the ingredients you need. : ) I still can't believe you tried those glutinous dumplings and I'm so glad you did! Thank you for all the encouragement, Wendy! What a delicious noodle dish! Love the way it looks and sounds. Another recipe bookmarked for the weekend. Oyster sauce, yes I have it all the time at home but more like an addition to other sauces while cooking an Asian dish. I like the idea of drizzling it over greens too...can't wait to try! Thanks so much. Glad you might give it a a try! I'm sure you'll put a nice spin on it to suit your taste and your family's. Oooh I love the noodles that you used in this recipe; it looks so thick and chewy! My favorite kind (: Coincidentally, I just had beef lo mein for dinner tonight, except it probably doesn't taste as good as yours because it was an order-in from Joy Yee's :P Wonderful recipe! Chunky, thick noodles are totally satisfying! : ) Take-out is a necessity in your situation, no doubt (for all of us sometimes)...I'm sure you whip up some mighty tasty meals yourself when you have a chance!